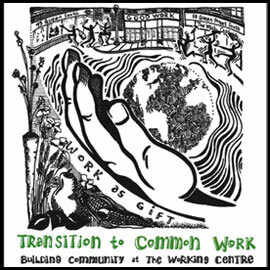 WATERLOO – Wilfrid Laurier University Press is pleased to announce the release of Transition to Common Work: Building Community at the Working Centre, by Kitchener’s Working Centre founders and award-winning social activists Joe and Stephanie Mancini. A primer on social entrepreneurship as well as the definitive text on one of Canada’s most innovative non-profits, the book tells the compelling story of the Working Centre’s beginnings in the city of Kitchener thirty years ago and explores the myriad ways in which its strategies and innovations can be adapted by those who share its goals. Transition to Common Work begins with an overview of The Working Centre, followed by a brief history of the organization’s early years. In later chapters, the authors move on to discussions of the nuts and bolts of alternative organizations, case studies on their own projects, and explorations of their philosophies around sustainable organizations and ethical working relationships. Ultimately, their vision is of a “transition to common work” in which cooperation and enterprise combine to teach new, sustainable models of working together to improve our communities and lives. The Working Centre launched in May, 1982 and in its first four years grew to offer a range of vital services in downtown Kitchener. Today, these services include St. John’s Kitchen, Downtown Street Outreach, ten social enterprises known as Community Tools, a job search resource centre, housing and technology access services, and the Waterloo School for Community Development. Countless partnerships have included collaboration with the Cities of Kitchener and Waterloo, academic program partnerships with Wilfrid Laurier University, and a partnership with Laurier's Sustainability Office and Libro Credit Union to launch a community bike share program known as CAB (Community Access Bikeshare). The Mancinis have been recognized on numerous occasions over the years, and in 2014 each received the Benemerenti Medal, a prestigious papal honour recognizing civil or military daring and courage.